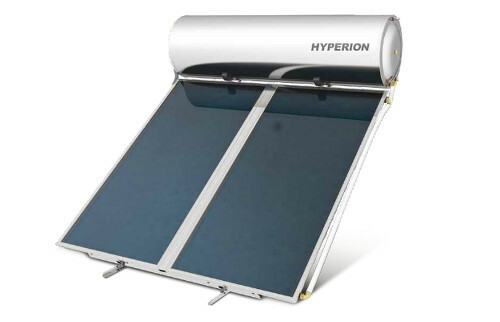 HYPERION Solar Systems constitute an ecological proposal and an effective energy solution, combining high output, autonomy, aesthetics, facility in the installation and money saving. They are made of excellent materials according to international specifications and have all the certifications and tests that confirm their quality. They are highly aesthetic systems, which can be simply and quickly installed to blend with the traditional or modern architecture of a building and to provide free hot water almost the whole year round. 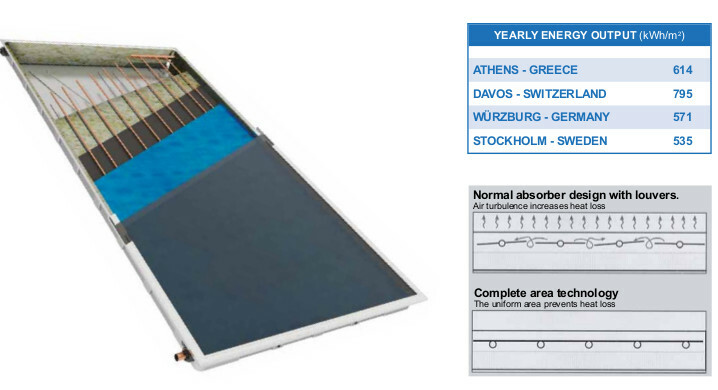 Even in regions with low sunlight they achieve the preheating of the water, which contributes to a drastically reduced consumption of conventional energy. With the use of solar systems, thermosiphonic or forced circulation, is achieved energy saving of 70-100%. At the same time the operation time of the boiler or electric resistance is decreased, depending on the sunlight of each region and the system’s size, with simultaneous reduction of emission of carbon dioxide. Cylinder: 2.5mm thickness cold rolled steel with a double internal layer of enamel, baked at 860°C according to DIN 4753. The enameling is done in our own high tech industrial facilities. The water storage tanks are checked individually upon exit from the enameling unit, assuring the top quality of the enamel. Surrounding heat exchanger (Jacket) with internal expansion tank: cold rolled steel, 1.5mm thickness for the operation of the closed loop, which is compulsory at low temperatures and also in areas with water with high mineral content. Thermal insulation: ecological, high-density, expanded polyurethane ensures minimum heat loss, maintaining the hot water temperature. External housing: naval aluminium alloy / pre painted galvanized steel. Cathode protection by 2 magnesium anodes Ø22x300mm and Ø22x500mm for effective protection against corrosion and mineral deposits caused by electrolytic reactions. Large round flange rubber protected: innovative, smart design for the quick cleaning of minerals, fast replacement of anode and immediate access to the electrical components. Complete sealing of EPDM, non toxic material, which does not permit water to contact the flange, thus protecting it against electrolysis and corrosion, specially made to withstand the generally accepted specifications with regard to the heat resistance. Heating element rated according to the country of destination local regulations. (Optional, for the use of electricity as an auxiliary power source). All electrical components carry a CE marking according to EN 60335-1 and EN60335-2-21 standards. Automatically regulated thermostat with bipolar protection and auxiliary fuse. All electrical components carry a CE marking according to EN 60335-1 and EN60335-2-21 standards. Protective cover: designed to ensure the proper ventilation of the electrical section and its protection from the environmental conditions. Gland: for sealing the passage of the heating element’s connection cable. Cold water inlet: brass 1/2” BSP male threaded pipe end for water stratification and 8bar safety valve for releasing pressure. Hot water outlet: 1/2” BSP male threaded pipe end. Jacket outlet: Closed loop circuit filling point: 3/4” BSP male threaded pipe end. 3.5 bar safety valve connection location: 1/2” BSP male threaded pipe end. Heat exchanger with 3/4”BSP female threaded pipe ends,made of stainless steel hose, large exchange surface for use of theheating produced by central heating systems during the winter (optional). External one piece aluminium trough of high aesthetics, shaped by deep drawing method in 400 tn capacity press, made of naval aluminium alloy, rich in magnesium. Robust construction for perfect tightness. High density, eco-friendly thermal insulation achieved with a 60mm thick layer of prepressed rockwool with a covering of black glass fabric for the minimization of thermal losses. Water frame of copper pipes of suitable gauge and thickness (headers: Ø22, manifolds: Ø8) Headers are punched with upper expansion, for perfect manifolds fitting, thus avoiding pressure drop in the collectors. 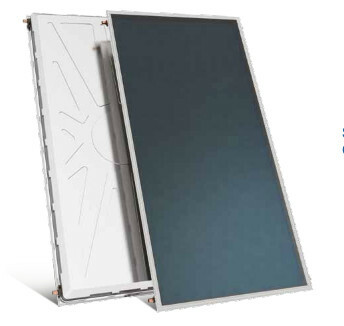 Sun-Selective complete area absorber made of selective aluminium sheet with a special titan coating formed in vacuum,of high absorbency and low radiation, covers the complete window area as well as the headers, thus increasing the collector’s absorbency, Laser Welded to the water frame. Special plastic parts for supporting and sealing the water frame to the trough, specially designed for the collector’s ventilation, with sensor supporting option. Special silicone rubber seals allow fluctuation of the absorber’s length (contraction - expansion) in a -40°C to +200°C temperature range. Tempered solar glass low iron, with a stable coefficient of expansion and high light transmittance, can withstand adverse weather conditions (e.g. hail storm, extreme temperature changes, etc. ).